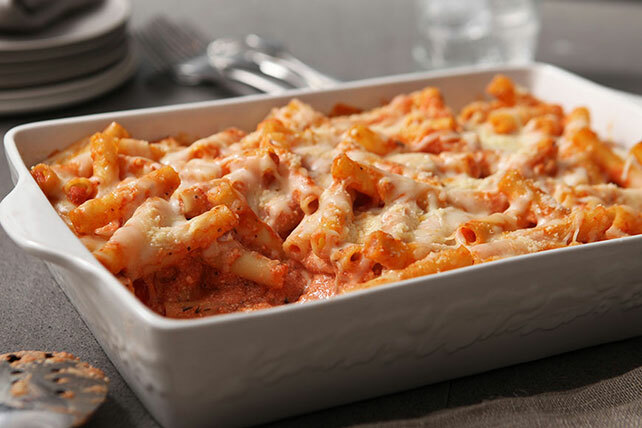 Discover the appeal of a delicious Baked Ziti. Your family will love this three-cheese comfort food. Have Baked Ziti ready for the oven in just 10 minutes! Cook pasta as directed on package, omitting salt. Drain pasta, reserving 1/2 cup pasta cooking water. Mix pasta sauce, ricotta and reserved pasta cooking water in large bowl. Add pasta and 1/2 cup mozzarella; mix lightly. Spoon into 13x9-inch baking dish sprayed with cooking spray; sprinkle with remaining mozzarella and Parmesan. Cover. Bake 30 min. ; uncover. Bake 10 min. or until heated through. Prepare using your favorite flavor of pasta sauce, such as mushroom.